Happy Friday, everyone! Hope you’ve all had a chill week thus far. For those of you who don’t know, She Dreams Elsewhere was accepted into DreamHack Atlanta’s Indie Playground under the “Best Arthouse” category, which took place in Atlanta, GA (obviously) from November 16-18. 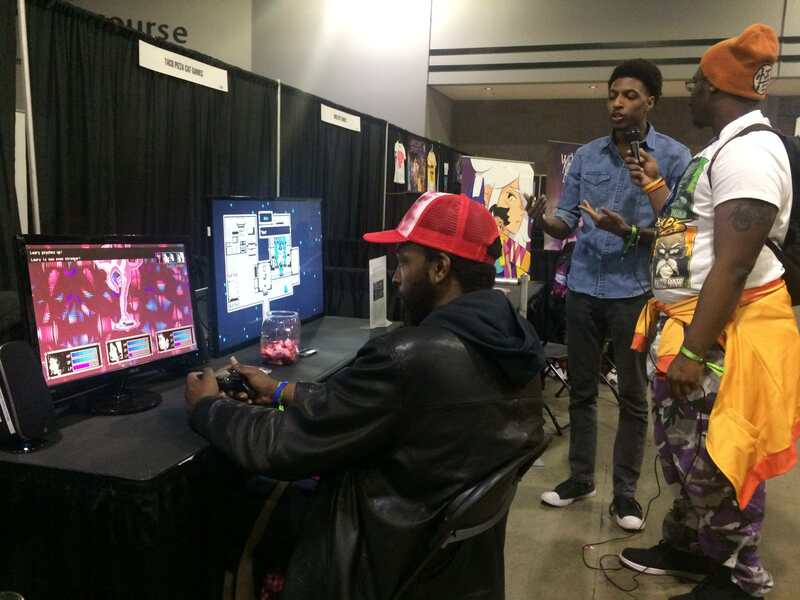 It included a free booth, two free tickets, laurels, and a chance to showcase the game live on an indie stage, among other amenities. 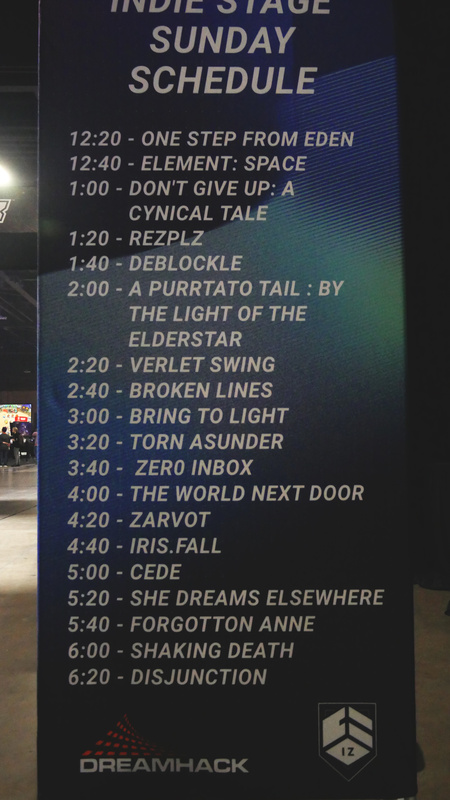 I first found I got accepted into the show on the last day of GDEX, believe it or not. So basically before I got through the game’s first expo, I had to start preparing for the second one that was a month and a half away, in a state/city that I had never been to that was also a 12 hour drive away. Oh, and the show itself was an absolute monster of an event compared to GDEX, taking place in a much bigger venue with a ton more attendees. No pressure, right? Gotta love depression. ❤ But I digress. Let’s get to the fun. This was, hands down, not only the best gaming event I’ve been to, but also the most memorable and validated I’ve felt as a game developer. It was so encouraging (and also a little weird, not gonna lie) to see people’s genuine excitement for the game, and how they would gush about how much they enjoyed it. I even got several comments about how great it was for black people to represented in a game like this, which was… ugh, God, my heart. 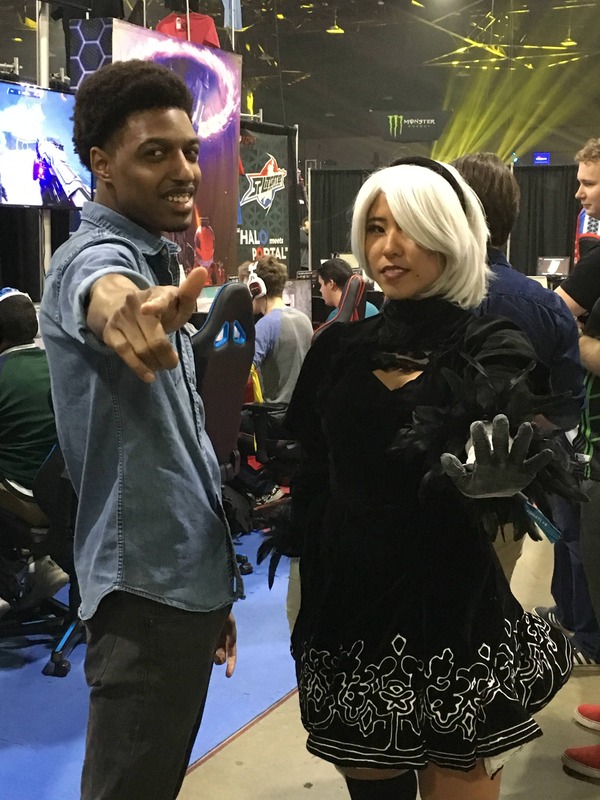 Also, all the cosplayers were dope. Wish I had more pics of em. I could go on forever about various anecdotes and interesting tidbits from the con, but there’s one in particular that stood out to me. 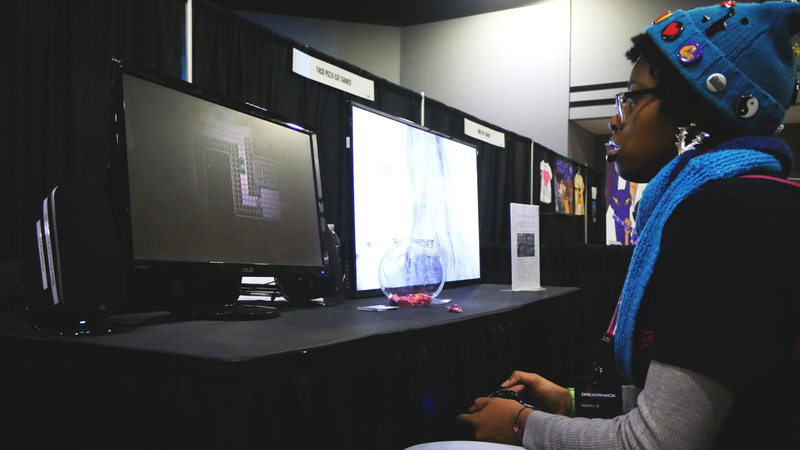 It was when a little 11 year old girl tried out the demo with her parents, who then couldn’t tear her away from the screen! It reminded me so much of how I grew with games as a kid, and why I went into gamedev in the first place. So yeah. Really wonderful event. (And that’s not even getting to the other stuff the con had to offer!) But now it’s reflection time, so let’s dive into what went right and wrong, shall we? Oh, and for once, I actually went back onto my personal Facebook and let my friends know the news too. So that was nice. I still hate Facebook with a passion, though. So as a broke solo dev who had never been to Atlanta before and didn’t have a car, I knew getting to the show was going to be a bit of a struggle. Thankfully, due to some amazing friends, I was able to make it work. Big shoutout to the homie, Zach Schwartz; he did all the driving from Cleveland to Atlanta and provided me with some well-needed company for the trip, which I can’t thank him enough for. Going back to the GDEX postmortem, I mentioned how the booth space there was small and awkward due to sharing it with other devs and space being a “first come, first served” type of deal. Here, however, I got a full 10×10 booth to myself, and I can’t stress how much of a massive improvement it was. Because of that (and having an actual driver instead of a Greyhound), I was able to draw way more attention this time around. I had the game itself playing on my normal monitor, while the TV looped gameplay and the new trailer (which I’ll get to next). Combined with the free candy and a info sign about the game, I’d say I did a much better job of attracting players to the booth. We were also in a high-traffic area next to similar indie games, so that was a major plus, too. Before the second day of the show opened, I decided to finally drop the first live-action teaser trailer for the game; if you haven’t seen it, here it is for your viewing pleasure. I actually shot it all the way back in August and had a rough cut ready shortly after, but I had to wait for my artist to finish everyone’s new portraits first before I could make final edits (again, huuuuuuuuge s/o to Yanina, you’re literally the best <3). Once that was done, I just had to decide when the best time for release was… something I finally decided on the night before the show, in the car ride en route to Atlanta. Hey, spontaneity breeds creativity, right? That’s a thing, isn’t it? Yeah? No…? Either way, it worked out for the best. After two weeks, it’s racked up over 2000 views on YouTube alone; more than double than what the original teaser trailer made in six months. I know that’s small potatoes compared to other games, but I’m pretty ecstatic about it. More importantly, though, is the attention it got on various subreddits, particularly /r/jrpg, /r/megaten (Persona/SMT games) and /r/rpgmaker; all of whom were very supportive and excited for the game. It also drew a ton of people to the booth since it was fairly unique and eye-catching. Although I did a better job of communicating the game’s presence before the show, I still could’ve done a lot better. I was initially planning on doing a couple devblogs to showcase and explain the design process of what people would be playing on the show floor, but due to other commitments, I simply didn’t have the time. I also was very inconsistent when it came to Instagram and Twitter posts, which I still need to get a better handle on. Also, I didn’t contact any journalists again; but to be fair, I didn’t see many of them at the event and there wasn’t an easy way to find out who would be in attendance. I was able to snag a few serendipitous interviews, though! One of said serendipitous interviews. Despite the demo’s content being mostly the same as the GDEX build, there was still a lot that needed to be added, changed and fixed – both for the demo build itself and to the game as a whole. (I kinda still have a whole game to finish at some point, y’know?) Added to this, I had several videography gigs booked in November, with most of them taking place the week before the event itself. Granted, these gigs paid for the trip, so in a way I HAD to do them if I wanted to go, but it was still pretty rough to manage. This meant I had to juggle filmmaking and solo game dev PLUS personal stuff and other misc. commitments, which led to lots of crunch, little to no sleep, and me going nearly insane in the leadup to the show. Hell, I had two unrelated videos with deadlines the day before I had to leave, and one of the clients requesting edits the morning I actually had to leave. And at that point, I had yet to pack and had a barbershop appointment later that morning. I should’ve straight up said no, but hey – hindsight is 20/20, after all. The video came out great, though! By the time I finally fell asleep, I had been awake for 40+ hours, with the show starting in less than 12. This is straight up unhealthy both physically and mentally, no doubt about it. Thankfully, since I’m a solo dev, I didn’t (nor would I ever) subject anyone else to this, but I really need to stop doing this to myself… as does the rest of the gaming industry. Don’t be an idiot like me. Yes, it’s art, I’m passionate about it, I love what I do and all, but at the end of the day… it’s just a video game. Please take care of yourself, y’all. We were allowed to get setup on two days ahead of the show’s official start. Because of my friend’s full-time job, however, we ended up having to leave on Thursday night. The drive from Cleveland to Atlanta is about 11-12 hours. We got on the road around 6pm, had to stop to sleep around 2/3am, and kept going around 6:30am. The show opened to the public at 12pm on Friday. It’d be cutting it extremely close, but hey, if that’s how it has to be done, so be it. Then the weather was pretty bad throughout all of Ohio. Then in the morning, we got stuck in traffic for an hour and a half. Later, upon entering Atlanta, we saw a car on fire. Then we got stuck in traffic again. Then it turned out our AirBnB was actually a 30 minute drive to the convention center, and we had to stop at Target first to get some supplies. Then it turned out I forgot some equipment back at the AirBnB, so we had to turn around, get it, and go back again (thanks, sleep deprivation!). …so yeah. All in all, I ended up being about three and a half hours late to the show, with my booth just being completely empty the entire time. While it ended up being fine overall since Friday was a chill day, it was still completely unprofessional and not at all a good start to the show. On top of this, I was an hour late on Sunday due to parking issues. There was a football game going on that day which I guess everyone in Atlanta had to go to, plus parking in that area was stupidly expensive and out of my budget. Finally, since my friend had a massage scheduled in Cleveland for the next day, we had to jet out of there practically as soon as the show ended, which meant I was unable to hang out with any of the other devs and rush my goodbyes. At least the drive back was totally chill. I already mentioned how stressful that can be in the GDEX postmortem, but it’s even moreso when it comes to a bigger event like this. Not that it didn’t stop me from wandering around during downtime; it just meant I had to mind the time a bit more, and I couldn’t really explore the event as much or as comfortably. Wished I could’ve watched a full Halo tourney, too, but oh well. I did have my booth neighbors to keep an eye on things, but that only goes so far since everyone’s focused on their own stuff, y’know? Plus, when things did go wrong and I wasn’t there, they wouldn’t have known how to fix things anyway, not that I expected them to. For instance, when I returned after doing my stage presentation, I found the game had crashed, and someone left their water bottle and a bunch of ripped Starburst wrappers on the table. Delightful. So like I said before, part of the Indie Playground selection included doing a live presentation on a designated “Indie Stage”. The maximum time limit was 15 minutes, but you could go for however long you wanted and do whatever you wished. Because of my own lack of planning and technical issues, however, I ended up significantly simplifying my presentation; not a bad thing in and of itself, I prefer short and sweet things anyway. I only showed the newest trailer, briefly went over the game’s concept and core themes as gameplay footage played silently in the background, and ended with an invitation for all two members of the audience to play the game at the booth. Ended up being about three-ish minutes total. …oh, yeah, there were just two people in the audience. Which I somewhat expected, as from what I saw and heard, most other indies didn’t really have much of a turnout either and kept it pretty short, too. Still, I really should’ve done something more. It was a live show after all, and I have plenty of theatre experience! Might as well use it, right? It was also being livestreamed too, but I didn’t receive the link until the day before and I couldn’t blast it out to people due to my phone not being on my person for the day (it was with my friend, his phone was broken). I also should’ve told players at the booth about the show, too, or maybe even held some sort of raffle to entice people to come through. It also might have been a mix of that and the fact that the show as a whole wasn’t indie-focused. The two people in the audience seemed appreciative of it, though. Okay, don’t get me wrong. 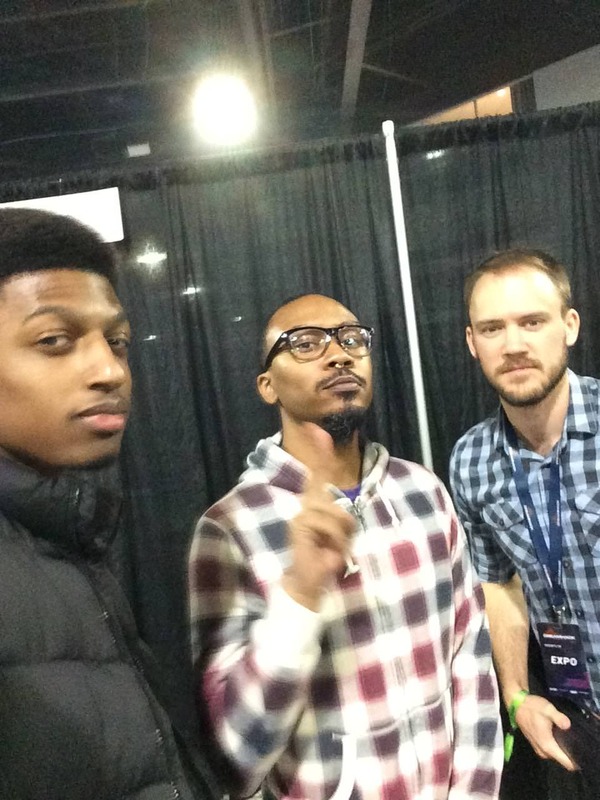 DreamHack was an amazing event, easily the best gaming expo I’ve been to, and the staff were all lovely to work with. 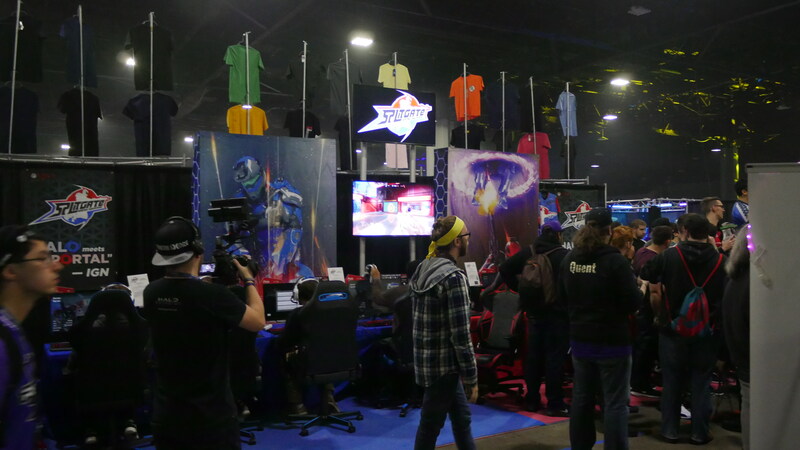 But the truth is, DreamHack and most of the attendees are primarily focused on the e-sports and multiplayer elements of the show, and that’s what got the majority of attention from folks. There’s nothing wrong with that, but when you’re making a narrative-focused, trippy turn-based JRPG and you’re literally right across the aisle from a fast-paced, Halo-esque FPS… well, you take a wild guess. “Splitgate”, the game across from mine. Great devs and FANTASTIC game, plays like butter and is a joy to watch to boot! There was definitely a ton of foot traffic brought on by it, but most people were there to see that and didn’t give a second glance at Dreams. Same goes for a lot of the indies placed in our row. Now granted, they were a much, much bigger studio with a larger budget, and I’m guessing the indies in the rows behind us didn’t have as big of an issue with this, but still. 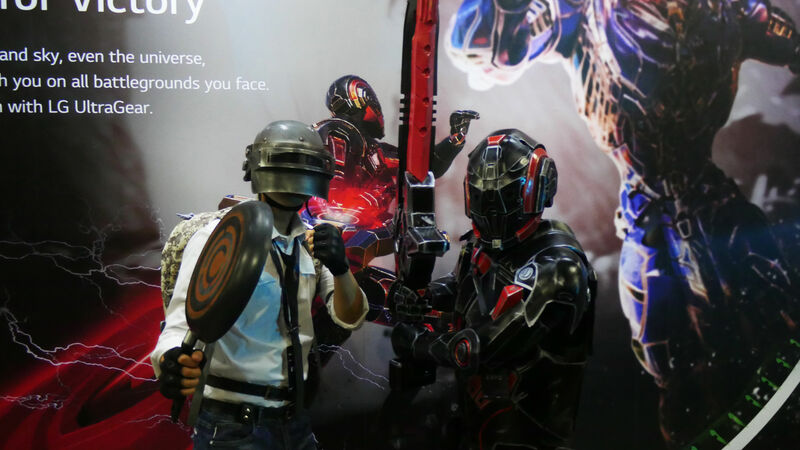 The main point I’m getting at is that if you’re planning on exhibiting your game at any kind of expo, you need to do your due diligence and find out what that expo’s goals and target demographic is. Are they more indie focused? Does it cover a wider variety of mediums? (anime, music, etc.) What are they trying to accomplish and who are they trying to attract? Knowing this is important to deciding on whether or not it’d be worth it to attend, especially when you factor in your own goals and the financial cost it would take to go. I had a blast at DreamHack and got a ton out of it, don’t get me wrong, but if I had to spend significantly more to go, only to not get as much out of it, then I probably would have reconsidered. And this goes for any expo, not just DreamHack. The event staff are there to help, so take advantage of it! I had a bunch of burning questions before the show, and the organizers were nothing short of timely and incredible to work with. They WANT you to succeed as much as you want yourself to, so if you’ve got a question or need help, don’t hesitate to ask! Try to figure out the parking situation ahead of time. Look up nearby garages, routes to the con, fees, where to load in/out, etc. Again, contact the event staff if you need assistance. I said it before, I’ll say it again – try to have someone come along with you, especially if you’re a solo dev. Ask friends, family, local game design schools… hell, I even considered posting an ad on Craigslist for an assistant at one point. It’s good to have SOMEONE at the booth to cover for one another, and as a travel buddy. Just make sure you brief them on your game and any potential questions people might have if they’re not familiar with it already. Rest. Please don’t crunch. Take care of yourself, please. Both for your own health and the expo experience as a whole. Also, stay hydrated and use hand sanitizer regularly throughout the day. Try to involve your players in other ways besides playing the game. They are playing and supporting your game pre-release, so why not show ‘em some love? Since dogs act as save points in-game and each have their own individual names, I thought of having players sign up their own dogs to be put in the game. Sadly, I only thought of this two hours before the show ended. Oh well, next time. Make friends with your players! While it’s best to stay silent and just let them play, if they/you strike up a conversation or discover a cool moment together, just go with it! Often enough, there would be groups of people that came around, so while one person played, I would talk with the others and end up having a great time conversing and joking with them! Don’t get rose colored glasses, though. Your players are only playing a small section of your game. They might love it for 20 minutes, but who’s to say they’ll love it after an hour? Or two? Or five? 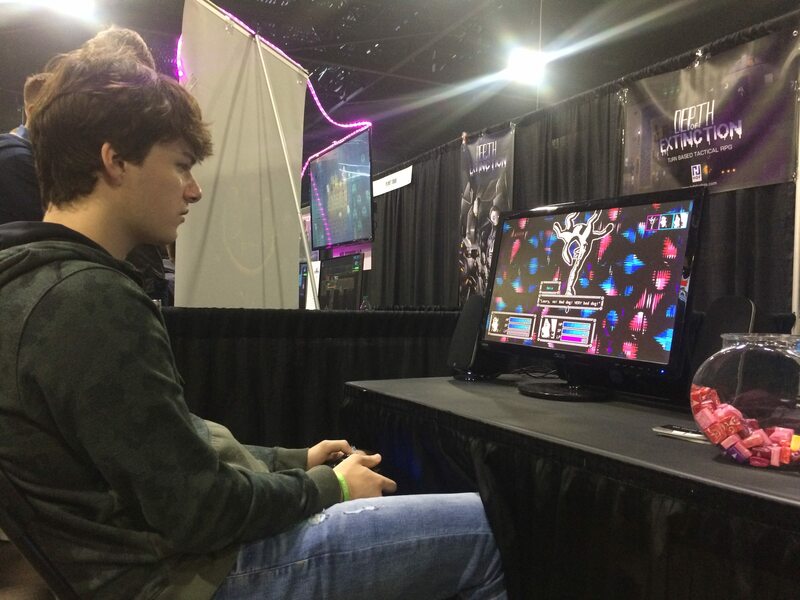 Take people gushing about your game with a grain of salt; they’re at a gaming expo, you’re an indie, and they’re talking to you face to face – most people aren’t gonna blast you right on the show floor and may not even directly tell you they don’t actually like it. That doesn’t mean you should disregard it, but just be mindful and pay attention to your players’ actions and their words. …whew. That was a lot. But yeah, that was DreamHack Atlanta 2018 for you! Overall, it was fantastic experience, and one I would definitely love to attend again in the future. Huge shoutout to Justin and Sydney for their hard work (and answering my annoying emails, sorry y’all), Zach for being a real bro throughout the trip (follow him on Instagram, he makes dope music and is a hugely talented writer, too), Hannah for starring in the trailer, and everyone who stopped by to check out the game! Also, shoutout to all the other amazing indies in the Indie Playground, with special regards to Tristan (Don’t Give Up, a hilarious JRPG which shares a lot in common with mine), Sam (Zarvot, one of the funnest and genuinely thrilling games I played there), CJ (Forgotten Anne, a gorgeous adventure game with Ghibli vibes), Aenne (Arcade Spirits, a comfy, romantic comedy visual novel where you work at an arcade), Thomas (One Step from Eden, a dazzling rougelike puzzler with Mega Man: Battle Network influences), Paul (The World Next Door, one of the most unique and fun takes on the Match-3 genre), Mike (Depth of Extinction, an intense turn-based, tactical RPG with rougelike elements) and Brian (The Subject, a creepy-as-hell horror puzzle game that actually releases today! Congrats mate!). All of these devs and more are extremely talented; I highly suggest you check out their work, you’re bound to find something you’ll love. Me, Tristan and Paul. Apologies for the blurry pic. And with that, that wraps up this postmortem. What do you guys think? Anything you’d like to add? Comments? Questions? Drop a line, I’d love to hear your thoughts. In the meantime, I’m off to celebrate my 21st birthday… or I would be, if I didn’t have a demo to finish. Ah, the joys of solo game dev. Thanks for reading and have a great weekend! She Dreams Elsewhere will be out for PC, Mac and Linux in early 2019, with a free demo releasing next Wednesday. In the meantime, you can wishlist the game on Steam and spread the word if you haven’t already. Also, feel free to follow the game on Twitter, Instagram or via email newsletter updates. There’s also my personal Twitter or Insta if you really care about what I’m up to. Next Post Demo is out NOW!